This very ancient town sits in a low basin along the Ouvèze river, beneath the watchful chateau on top of the Haute Ville hill on the south side of the river. The town, with its vast collection of ancient ruins, is picturesque and dynamic. During the summer season, Vaison is alive with music festivals, dance festivals and theater. 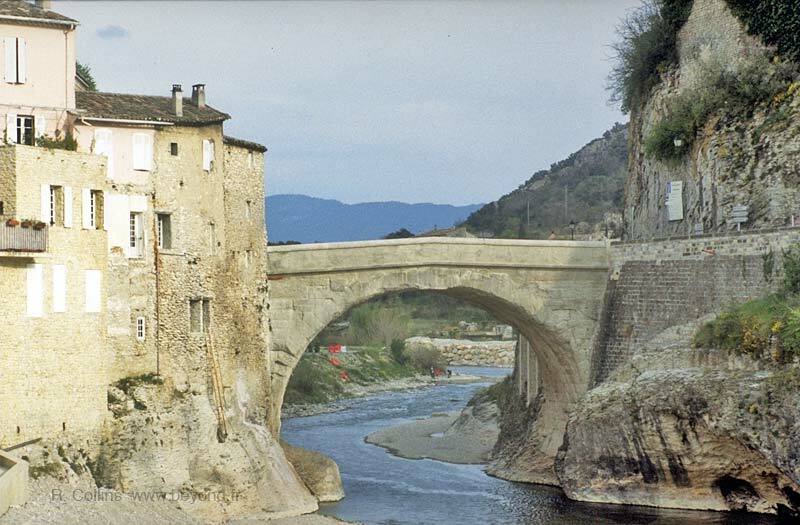 The two parts of Vaison-la-Romaine are joined by a unique single-arched Roman bridge over the river, still in use after some 2000 years.  Market day Tue, Sat. On the north side of the river, the main part of town has shops, cafes, restaurants, boutiques, souvenir stands, and the Roman archeological sites. Vaison is quite a large little town, with an extensive residential area extending out from the center. There's some small commerce in the center, such as butchers and bakers, but you'll have pick them out from the many tourist-oriented shops. 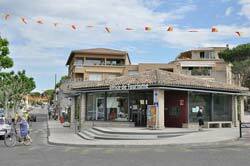 There are larger grocery stores in Vaison-la-Romaine, but mainly located on the outskirts of the town. There's also a cinema in Vaison, just in case the weather turns bad. The main cafés-and-shops street is the Grand Rue, running from the Roman bridge up into the center by the Tourist Office and the main parking. It's a bit calmer off to the east side at the Place Montfort, a large, open square that's lined on one side with a row of terrace café-restaurants. In the center of town, across from the main parking lot, is Vaison-la-Romaine's Office de Tourisme. We found (on each visit) the staff to be pleasant and knowledgeable. In addition to the normal documentation and information, local products, including wine, are also available. The Puymin Quarter is located just to the right of the Office de Tourisme. The entrance to both parts is here, and inside, in addition to excavated ruins, is a museum and the 6000-seat Roman Theater. The Villasse Quarter is located across the parking lot from the tourist office. This large area has excavated houses, streets and baths. For entry, you'll need the ticket from the Puymin Quarter ticket office. The Roman Forum is currently being excavated and is not open for visits. There are some viewing windows in the high barrier along Avenue Jules Ferry, so you can watch a bit of the excavating. On 22 September, 1992, there were about four hours of intensive rain in the area, including at Entrechaux, Buis-les-Baronnies, Vaison-la-Romaine and Malaucène. The rains caused an enormous and sudden flooding of the Ouvèze river. The level of the water at Vaison-la-Romaine was about two meters above the roadway of the Roman bridge. At the north end of the bridge, you can see the water-level plaque, well higher than the bridge railing. The short-duration flood began receding only five hours after it peaked, the the cost was huge. There was a half-million francs (80 millions of euros) damages, and 41 people killed. A Little Touring Train (Le Petit Train) takes you on a 35 minute tour of Vaison-la-Romaine, including the main town, the Roman Bridge and the Cathedral. The cost is €4.50, kids under 12 free. Departure is from in front of the Office de Tourisme. April, May, June, Sept: first departure is 14h15; last departure 17h15. July, Aug: first departure is 10h00; last departure 17h15. Prehistoric: Many traces of ancient civilization found here are from the chalcolithic period, 2500-2000 BC. Celto-Ligurian: During the Iron Age, a major Celtic-Ligurian Vocontii oppidum was located on the Haute Ville hill on the south bank of the Ouvèze river.The Vocontii, along with the rest of the southern Gauls, were defeated in the Roman campaigns of 125-118 BC and brought into Transalpine province as a federated city, leaving it a large amount of autonomy. Medieval: In the 12th century, the Counts of Toulouse, who built a chateau on the hill, and the bishops began a conflict that lasted for 100 years. From the 13th century, the local population began moving for safety from the north side of the river to the base of the chateau on the rock. The move increased during the 14th century, because of the Hundred Years war and the marauding Routiers. Vaison was an important diocese in the Comtat, and was controlled by Saint-Siège from 1274 to 1791. During the 17th and 18th centuries, some of the population began moving back to the plains north of the river, and by the middle of the 19th century, a new town was in place on the site of the ancient Gallo-Roman town. Market day: Tue, Sat. Daily during the growing season. Nov (2nd week) - Journées gourmandes, including Soup Festivals here and in surrounding villages. The GR4 hiking trail passes through the forested hills south of Vaison, between Roaix and Malaucène. There are several other trails that branch off from the GR4, including many loop-hikes, extending south to Gigondas and Beaumes-de-Venise. East of Vaison, there is some hiking in the wooded hills south of St Romain-en-Veinnois and Faucon. The maps are printed on lightweight, durable, water-resistant paper, and include information for 44 separate day-hikes, with times mostly in the range of 2, 3, 4, 5, 6 hours. - Orange, Camaret, Travaillan, Cairanne, Rasteau, Roaix, Vaison. - Orange, Camaret, Violés, Sablet, Séguret, Roaix, Vaison. - Malaucène, Crestet, Vaison, Villedieu, Buisson, Visan, Valréas. - Carpentras, Caromb, Le Barroux-Bas, Malaucène, Crestet, Vaison. Schedules. We do NOT have schedules for any of these bus lines. Main-line train service is availble at Orange.